Not Eiichiro Oda’s One Piece (Viz). That’s more likely to end in elation, if it ever actually ends. I’m talking about this process of writing about it all the time. I just know that these intermittent blog posts about the series will end up reading like those chapter breaks from Genshiken. They won’t make any sense to anyone who isn’t as hooked as I am, and I’ll start using some ridiculous numerical code to discuss character awesomeness. We’ll cross that bridge when we come to it. For now, we’ll talk a bit about Nami. Nami initially strikes the reader as your typical shônen girl. She’s cute, but she doesn’t smolder. She’s keenly aware of her compatriots’ intellectual shortcomings, but she’s a good sport at the end of the day. She pitches in when things get rough, and she provides some eye candy for the girl-crazy characters (and the fanboys). She seems destined to settle into life as a Straw Hat, dutifully serving as the big sister. Then she robs them and takes off in a boat while the Straw Hats are getting their asses handed to them. 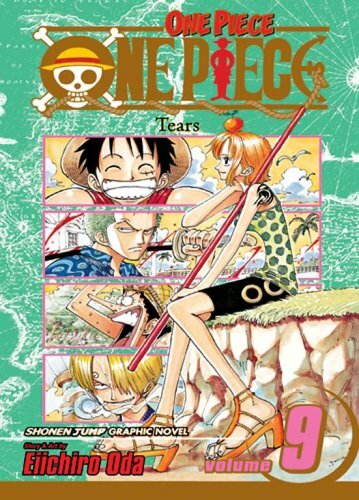 In the third omnibus edition, collecting the seventh, eighth and ninth volumes, we find out about Nami’s association with a considerably more traditional group of pirates who rely on Nami’s navigational skills and aptitude for deception. Then we find out why Nami is working with Arlong’s brutish, greedy crew, and we see the lengths she’ll go to in service of her goal. And by the time all of these things have happened, the reader realizes just how formidable Nami is. She’s playing a very dangerous game, and she’s playing it as well as a person of her age and experience can, but it’s evident that this will end in tears. But there’s also Luffy, and while Nami is providing the best example yet of Oda’s facility for genuinely moving drama in the midst of wacky mayhem, Luffy is proving that there’s more to the dim rubber kid than there seems. He’s already demonstrated his ridiculous confidence and his ability to clobber much more formidable opponents. With Nami, he displays another essential aspect of his nature, that being his excellent ability to judge the character of others. As Nami’s mystery unfolds and his crewmates are flailing around trying to solve it, Luffy is mysteriously at his ease. He’s waiting, but for what? That’s after the jump. You are currently browsing the The Manga Curmudgeon blog archives for the day Sunday, March 28th, 2010.